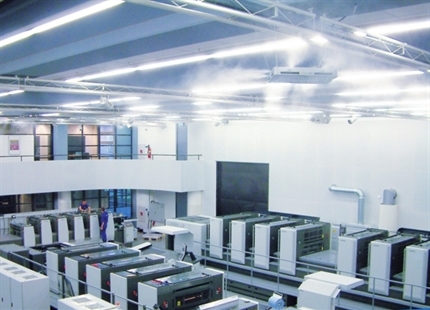 Heidelberg and hp inc. will humidify two complete halls at drupa with a DRAABE air humidification system. Europe’s largest temporary air humidification installation is now being set up to cover a total area of over 16,000 m2: air humidification system manufacturer DRAABE will supply humidification units to cover all of exhibition halls 1 and 17, to be used by leading printing press manufacturers Heidelberg and hp inc. Constant, optimum air humidity is an essential requirement for the two machine manufacturers to prevent electrostatic and paper distortion problems during live demos at the Düsseldorf show. The system used will be DRAABE’s TurboFogNeo 8. Over 50 high-pressure air humidifiers will soon be installed in the hall ceilings and supplied with hygienically pre-treated water via four integrated DRAABE PerPur reverse osmosis units. DRAABE will be exhibiting at drupa from 31 May to 10 June in Hall 16 (stand D43) and in Heidelberg’s Hall 1 (stand B10), where it will offer a world premiere of its next-generation water treatment and high-pressure pulsation systems. For further details, please visit www.drupa.com. hp inc. has thanks to the DRAABE System a constant, optimum humidity during the entire exhibition. Heidelberg also relies on the professional DRAABE technology for this year´s drupa exhibtion.